Century Cycles Blog: Not-so-trivial trivia about "Breaking Away"
This useless knowledge can actually win you cool prizes (Cinzano wool jersey! DVDs! Campy cycling caps!) at the Breaking Away Party with Masi and Century Cycles on Friday the Thirteenth. 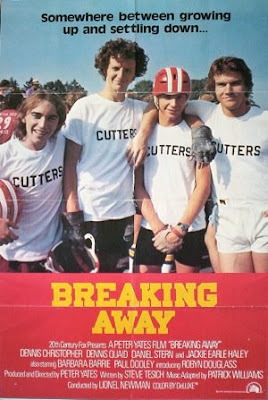 "Breaking Away" was released on July 13, 1979, in the United States. It was released on December 22, 1979, in Italy. In Italy, the movie was called "All American Boys." In Spain, it was called "El Relevo" ("the relay" according to Google Translation). Dave's bike in the movie is a 1978 Masi Gran Criterium. It was filmed on location in Bloomington, Indiana, on the Indiana University campus. "Breaking Away" is ranked #8 on the American Film Institute's 100 Most Inspiring Movies of All Time. It's ranked #8 on their list of the 10 Greatest Films in the "Sports" genre. It is also #8 on Sports Illustrated's list of the top 50 sports movies of all time (Aug. 2003 issue). The production team decided to call the Bloomington townies "cutters" because they felt the actual local nickname ("stoners" or "stonies") would draw a parallel to drug references for viewers who were not raised in the area. The "Dave Stoller" character is based on David K. Blase, who had once led a team to victory in the Little 500 and had an Italian fixation. Blase had a cameo as a race announcer in the film. The Little 500 began in 1951 as a fundraiser for scholarship money for working students. The race was created by the late Howard S. "Howdy" Wilcox, who patterned it after the Indianapolis 500, which his father had won in 1919. The Little 500 is now the biggest amateur bike race in the United States, attracting 25,000 spectators on race day. This year, the women's Little 500 is on April 24 and the men's is on April 25. Race guidelines dictate that there are 33 teams of 4 racers each and all racers must attend IU. Dennis Christopher was actually 23 years old when he played "Dave Stoller," for which he won a Best Juvenile Actor in a Motion Picture Award. He and Paul Dooley played father and son in another movie besides "Breaking Away" and also in an episode of "Law & Order: Criminal Intent." They tried making "Breaking Away" a TV show, with Shawn Cassidy as "Dave." Sure! I don't think we could get away with "frisking" our guests to check for cheat sheets! Especially where I was going to hide it. hehe.